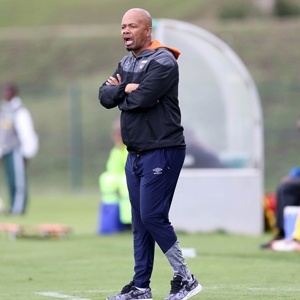 Cape Town - Chippa United coach Teboho Moloi attributes his early success at the club to keeping things simple, and explained that his philosophy is about emphasising defensive duties. Since taking over the side from the sacked Dan Malesela, Moloi has guided United to seven games without defeat including a fine 1-0 victory over Mamelodi Sundowns in the Telkom Knockout. With the Chilli Boys now playing a style seemingly less focused on keeping possession, the results have been positive during the 49-year-old's time in charge. As such, the ex-Orlando Pirates assistant coach explained that his side's playing philosophy is built on a simple approach and defensive fortitude. He told Sowetan Live: "I have learnt from many of the top coaches. I said they should work hard and play without restraint. I was a player who liked to go forward and who didn't work hard enough for the defence but recognise how important it is to get the back right first. "So we have worked hard on our defence. We go into each match knowing that we have a point in our possession already and our first job is to defend that point. Then we work on how we are going to take the other two." The Chilli Boys next face Bidvest Wits at the Bidvest Stadium on Wednesday evening in a PSL clash with Moloi aiming to extend their unbeaten start to their league campaign.